You are here: Home › Ambulance Services › Two SJEAS staff recognised with national award. Two SJEAS staff recognised with national award. 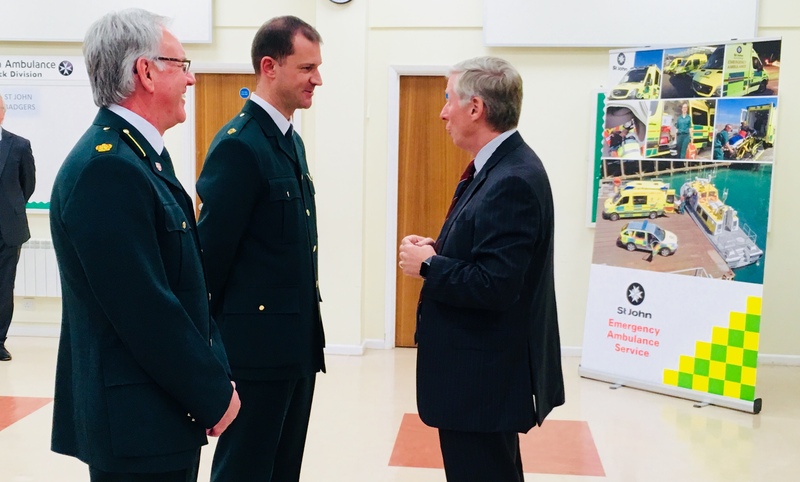 The Lieutenant-Governor of Guernsey, His Excellency Vice Admiral Sir Ian Corder KBE CB has presented two members of the St John Emergency Ambulance Service with national long service medals. 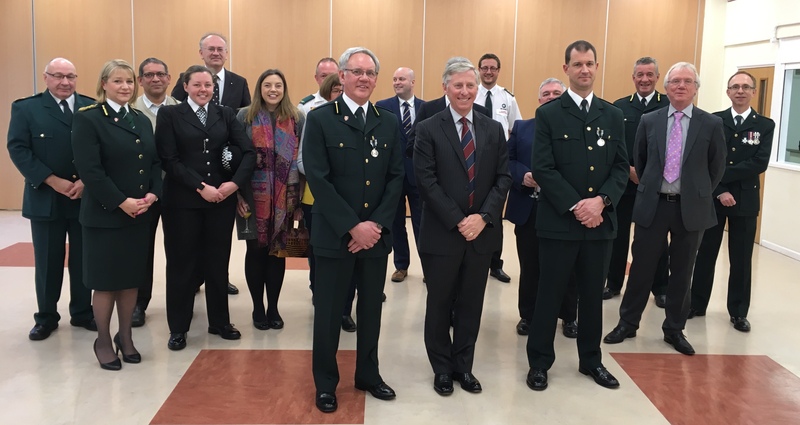 Senior Officer Malcolm Mechem and Paramedic Steve Domaille received the ‘Ambulance Service (Emergency Duties) Long Service & Good Conduct Medal’ at a special ceremony at the St John Headquarters at the Rohais this week. The medal is a national award which is gained after completing 20 years of exemplary service to emergency ambulance service duties. Sir Ian Corder congratulated Malcolm and Steve on their personal dedication and commitment to the community. Malcolm Mechem initially joined the Patient Transport Service (PTS) in 1998 before training as an Emergency Medical Technician (EMT) and then Paramedic. Malcolm has also been an engineer on the Flying Christine and trainer to ambulance staff. He became Senior Officer in 2011 with oversight of Emergency Planning, the vehicle fleet, administration and PTS. Steve Domaille also started his career with PTS before progressing to the role of EMT and then Paramedic. He has served with the Cliff Rescue and Inshore Rescue Boat teams. Steve has also worked as a Station Officer and Senior Officer, before returning to his operational position with the Service as a Paramedic.